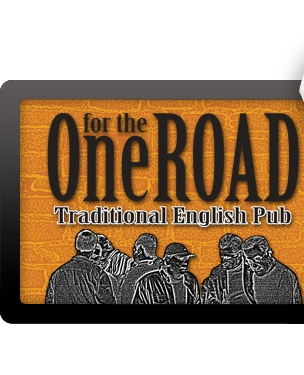 Welcome to the Events page for One For The Road. Soon, we will have many useful pages of event information (Including the NEW CHAMPIONS CORNER), easily accessed through this section (and the main menu). For now, Please check out the Calendar for event details and times. One for the Road has been running full steam for the past few months hosting major events one after the other and December sees another 3 huge party events coming up. 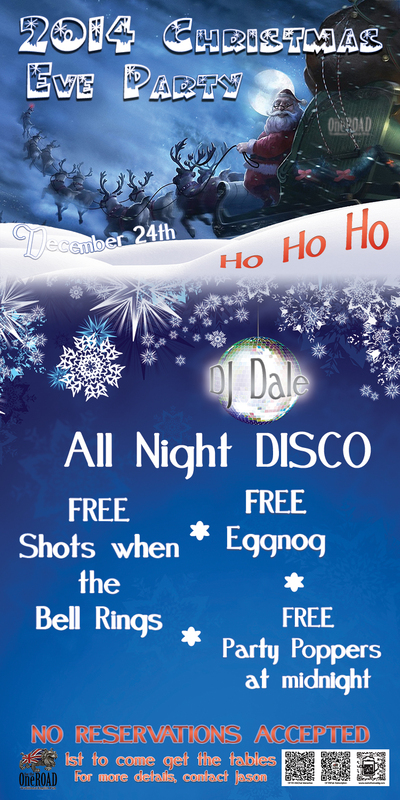 This Christmas Eve we have invited DJ Dale to come play for a Christmas party night to go along with the free eggnog and free shots. Christmas Day we have our Traditional Christmas Buffet which this year will also feature a roast ham. 5 years ago the Dongguan Dragons Kids Baseball Chili Cook-Off started at Shooters as a means to raise funds for the kids baseball team in the city to purchase equipment, uniforms and further the sport within the local population. The Dongguan Dragons Baseball have taken part in numerous international tournaments against other clubs in the PanPacific region reaching numerous finals and semi-finals and no doubt will win some in the near future. From that some of their players have gone on to represent their home countries at junior level. Over the years the Cook-off has grown in stature & popularity to the point that a new venue was necessary to hold the numbers turning up for the event. When approached about hosting the venue for the years Chili Cook-Off, One for the Road said we would be happy to do all we can in support of the Dragons. The entire beer garden will be reserved for the event. The event is to be on the 7th of November and tickets are available at the pub and all proceeds again go to the Kids baseball team! One for the Road is famous in Dongguan for it’s Halloween Disco Party (Click for Event on Calendar) with record numbers turning up for the 2014 party, 2015 should be quite exciting! But adding to the party, some may have noticed on the anniversary party we have super big ice bucket tables (NOT CHAIRS) so you can get more bottles (approximately 20) without needing to wait at the bar for service! The British Chamber of Commerce is organising a Brit Day event in Shenzhen on Sept 12. Once again One for the Road will be present for the event serving Fish & Chips, Battered Sausage & Chips, Chips, Mushy Peas, Pickled & Onion Rings. We will also be taking 3 of our Beers, (Bombardier, London Stout & McEwan’s as well as our London Cider and Imperial Ginger Beer. For the kids we have water, coke, sprite, coke zero & fanta. It is Bao’An at the China UK College which is near the old airport. If we have enough interest the pub will lay on a bus to take people there and bring them back so email the pub if you want a fun day outside your normal environment. May was a relatively quiet time at One for the Road activity wise as we were all partied out from April. But June we are hosting one of the biggest parties of the year! June 27th is our 9th Anniversary party and everyone knows that is a party not to miss! But really it is just relief and gratitude to all of you that we had the privilege of serving you another year. So many friends have left and we make new ones along the way but it does not mean we stop missing them and yes that also goes for IH. DJ’s Dale & Rhino Ron are rocking up to entertain for the evening with good disco music. The bell will ring for free shots. There is a free BBQ for all One for the Road customers that pre-book (email to jason@onefortheroaddg.com or whatsup@onefortheroaddg.com with the subject line (very important) BBQ PASS). And of course a slice of birthday cake. One for the Road had it’s busiest month in it’s 9 year history throwing 4 major party/events and serving hundreds of customers every day. Saturday 10th saw Sue Johnstone’s 25th birthday with over 100 friends & colleagues attending she has enough bottles behind the bar to last a while. Saturday 18th was the launch party for the HubHao online & print magazine bringing more information to the community in Dongguan. With over 550 people attending the event the atmosphere was electric and everyone had a great time. One for the Road laid on a free BBQ with the from 6:30 till 9:30pm giving everyone the chance to grab the BBQ at least twice and most did. Saturday 25th was the St. George’s Day Party with 25rmb Pints of beer, each beer you received a voucher and 6 vouchers got you a shirt. The event was attended by 600+ people 180 of whom received shirts (I am sure you have seen some wearing them around town) and would have been a night to remember if anyone was sober enough to do so, but no one was. Wednesday 22nd saw the British Chamber of Commerce hosting a seminar discussing manufacturing, assuring quality standards and corporate transparency. There were two guest speakers attending with 50+ attendees. Michael Page Professional Recruitment Consultants kindly laid on free beer for the event and the pub laid on a free buffet to boot which meant the attendees didn’t need to buy a thing that day! The season is upon us and the decorations start coming out, get ready for the endless Christmas songs but don’t be a grouch it’s a festive time to be enjoyed by all. Christmas Eve is when the pub move into top gear till Jan 1. We will have some free eggnog on offer as well as bell-rings, a Christmas disco and party poppers for all to enjoy. Christmas Day we have our Traditional Christmas Buffet which will be limited to 110 people (already 22 reservations means 88 seats are left. As well as the buffet you also receive a special One for the Road gift. 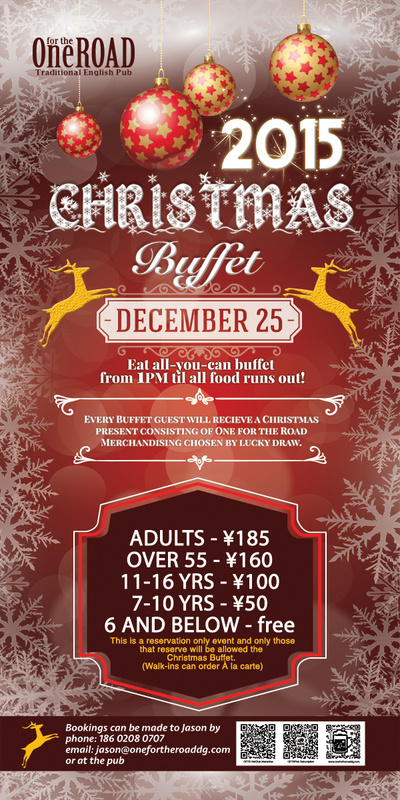 Everyone that has attended a OFTR Buffet will tell you that if you are stuck in Dongguan over the festive season then One for the Road is the only choice for Christmas Dinner. New Years Eve is one of the busiest nights of the year for the pub. Last year we had 300 people and now with the renovations we expect more. Everything is organised to make new years eve a night to remember. Former “Hot Gissip” UK DJ Dale will be here for a night of classic disco party music to help you celebrate the night in style. Huge digital clocks will be giving a countdown to midnight to make sure you don’t miss the moment. Party poppers will be distributed for all to enjoy the moment. As China becomes more aware of western cultures and traditions more companies want to help their staff experience some of these joys. One for the Road has a private room upstairs for small private parties and larger groups can enjoy the whole second floor or the beautiful beer garden can host parties of anywhere from 10 people up to 160 people. As well as a traditional Christmas buffet we have a selection of buffet and BBQ choices for our customers to choose from. Since opening One for the Road we have been the main place for Thanksgiving dinner in Dongguan because of our quality and price. And once again this year we are putting on a spread unmatched anywhere else! We will have 2 buffets as usual, 1 on the first floor and one in our extremely popular beer garden. And even more good news with the fact we are charging the same price as last year for an EAT ALL YOU CAN BUFFET. The portion is as large as you want it to be! However, over the years we have experienced a slow increase in last minute cancellations. This we understand as business is unpredictable in dongguan, however we waste a lot of Turkey and veg due to this. So this year we are pre selling tickets from November 15-23rd. If you have not bought your ticket by the 23rd then we cannot offer you the buffet. So far we have 28 people emailed reservations for the buffet tickets so don’t leave it late. This years Halloween party was our busiest yet, the new garden being able to seat 160 people our capacity expanded dramatically. However even with the expansion there were not enough tables and chairs for everybody but that did not dampen the mood on the night as people were very happy to stand and congregate and chat with their friends. The costumes were fantastic and many enjoyed the disco of DJ Ronnie as well. The face painters were busy from seven until 11 painting faces non-stop and a special thank you goes to CiCi for helping us procure their services and the face painters themselves for their tireless work. But for me the biggest thanks goes to the dedication and huge effort from the staff! They were so busy they did not have time to eat from 6 PM till close. The dayshift only managed to finish work at midnightwhich meant they had worked 13 hours that day and all must have run the equivalent of a marathon or two that night and again underscores how lucky the pub is to have such an awesome team working in the pub. But also please remember our unsung heroes in the back that cooked 642 meals that night. It’s never easy and always hot, but they managed superbly considering the sheer numbers involved and we thank you all for your patience on the night. Please enjoy the photos, share their links on social media, and come join us for our Thanksgiving, Christmas Eve, Christmas, and New Years Eve parties this year!